Nestled among the trees and open green space of Braddock Park, the Picnic Pavilion is the perfect venue for any outdoor function or gathering such as family reunions, company picnics, club or association outings, birthday parties or neighborhood barbecues. 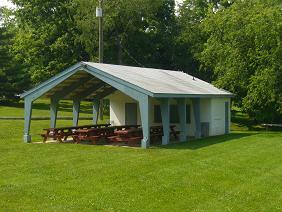 The Picnic Pavilion may be reserved for daily use from 9 am to 9 pm, seven days per week. Here are the current rates. Facility location details are here. Download the Facility Rentals brochure.